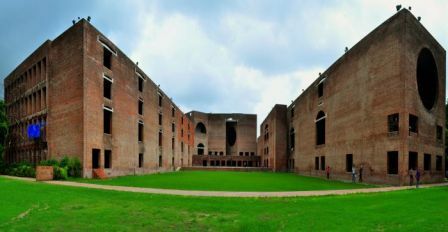 The 1-year full-time PGPX program at IIM Ahmedabad is maintaining its lead over the 2-year full-time PGP program by way of higher average salaries for the cohort at the final placements 2017, a trend it has been maintaining since 2015. The Maximum Earning Potential (MEP) or Cost to Company (CTC) in domestic for the 1-year PGPX Class of 2017 is reported at Rs 43,03,177, Median Rs 28,00,000 and Mean (average) Rs 28,48,538 after the audit by Brickwork Ratings under the Indian Placement Reporting Standards (IPRS). For the 2-year Post-Graduate program (PGP), the MEP is Rs 53,00,000, Median Rs 22,00,000 and Mean Rs 22,57,815. Earlier, the year 2015 had seen a Rs 72 lakh gap in highest international salaries and Rs 8.3 lakh gap in average domestic salaries received by PGPX and PGP students. The PGPX graduates had received Rs 1.38 crore as the highest international salary, Rs 54.55 Lakh the highest domestic salary and Rs 28.76 lakh as the average domestic salary. The PGP graduates had netted Rs 73.38 lakh as highest international salary, Rs 53 lakh as the highest domestic salary and Rs 20.47 lakh average salary. This was also the year in which IIMA’s PGPX was ranked as the number 1 MBA program by Financial Times. Incidentally, this was also the year in which IIMA’s PGPX was ranked as the number 1 MBA program by the Financial Times. In 2016, PGPX graduates got Rs 43,73,002 as highest domestic MEP, Median 27,81,004 and Mean Rs 29,10,943. 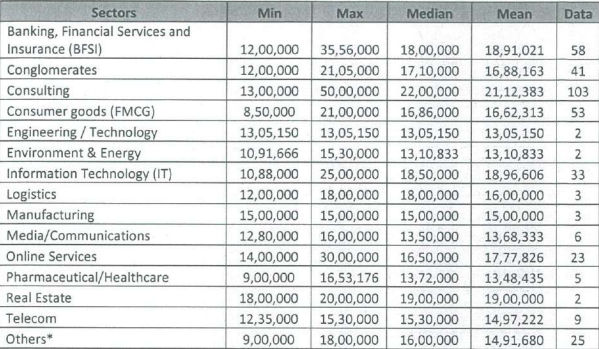 The PGP graduates received Rs 48,00,000 highest MEP but a Median Rs 21,00,000 and Mean Rs 22,14,043. Here again, there is a difference of Rs 6,96,900 in the mean salary received by the PGPX and PGP cohorts. In international MEP, PGPX graduates, just two of them, managed to get an MEP of $ 128,160 compared to $ 153,568 drawn by 15 PGP graduates. The Median was Rs 1,23,080 and Mean Rs 1,23, 080. The PGP had a Median of $65,345 and Mean $73,580. It makes a difference of $49,500 in the mean salary received by the PGPX and PGP cohorts. In the latest placement figures, none of the 91 students of the PGPX batch, including one who returned from a placement holiday, received an international offer. The 18 students of the PGP batch managed an International MEP of $ 127,275. Since the PGPX cohort comprises of people from diverse backgrounds with a considerable work experience ranging from 6 years to 15 years, they were offered positions such as COO, Operations Director, Associate Vice President, Business Development Executive, Principle Consultant and Associate General Manager. The recruiters included Accenture, Adani, Amazon, Capgemini, Genpack, IBM, ICICI Bank, McKinsey Digital, SAP, Telangana Government and Virtusa Polaris. Accenture and Persistent Systems made the largest number of offers. In PGPX, of the 91 students eligible for placement, 12 did not seek placement through the institute while one was company sponsored or already employed. Of the total 79 who sought placement through the institute, 12 remained unplaced. The total number of offers accepted was 67. In function-wise job offers, the maximum 26 was in System/IT followed by 16 in General Management and 11 in Operations/Supply Chain. In MEP, the Median was Rs 28,00,000 and Mean 28,48,538. 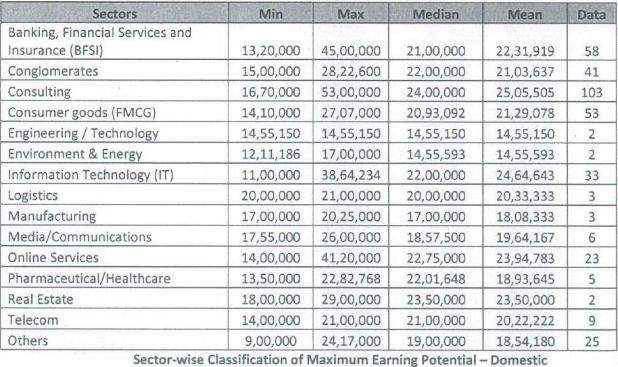 Sector-wise, maximum MEP was in Information Technology (IT) at Rs 43,03,177 (Median Rs 28,83,000 and Mean Rs 29,86,126). Consumer goods (FMCG) comes next with MEP of Rs38,00,000 (Median Rs 28,00,000, Mean Rs 31,33,333). Function-wise, the MEP is maximum in Consulting at Rs 43,03,177 (Median 36,60,000) followed by System/IT at Rs 42,07,524 (Median Rs 28,28,000, Mean Rs 28,62,040). For the PGP placements, more than 120 firms participated. Recruiters in the management and consulting domain included Citibank, Credit Suisse, Deutsche Bank, Goldman Sachs, JP Morgan, Kotak IB and Standard Chartered. The BFSI recruiters included American Express, FinIQ, Fullerton and RBI. Sales & Marketing roles came from regular recruiters like Airtel, Asian Paints, HUL, ITC, Nestle, P&G and Reckitt Benckiser. Amazon made the maximum number of 18 offers. 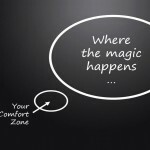 McKinsey followed with 15 offers in the Consulting domain. Among global banks, Goldman Sachs picked up 9 students. The 400 students eligible for placement included 370 PGP graduating in 2017, 12 PGP and dual degree students graduating in 2018. The 386 students who sought placement through the institute accepted an equal number of offers. The maximum number of 103 students went into Consulting (domestic) followed by BFSI (Domestic 58, International 7), FMCG (domestic 53, international 3) and Conglomerates (domestic 41, international 7). In domestic salary, the maximum MEP was Rs 53,00,000, median Rs 22,00,000 and mean Rs 22,57,815. MEP international was $127,275, median $65,351 and average $68,104.